I published a piece in 2001 about the corruption of higher education resulting from the huge amounts of money in collegiate sports, especially at the NCAA Division I level, and especially in men’s basketball and football. If I had any wild notions that my revelations would cure the problem I was wrong [!]. The problem has simply grown worse in the interim and I have blogged several times about outrageous scandals in the collegiate ranks. The latest incident involves the men’s basketball program at the University of Louisville; more importantly it involves the FBI. Now things will get serious. The FBI has been investigating evidence of “pay-for-play” scandals in several universities for a couple of years now and the revelations regarding Louisville’s men’s basketball program are the headline-makers; but apparently there are a number of other men’s basketball programs involved and the web of intrigue will continue to grow and eventually, it is believed, will include some of the major collegiate football programs as well. We haven’t heard nothin’ yet! But what we have heard makes a person cringe, especially if that person likes to think that college is about education and not about high-power sports involving millions of dollars. In any event, Louisville has been charged with improprieties involving Adidas which signed a contract recently with the university for $160 million over a ten-year period, reportedly including $2.1 million for Rick Pitino, the long-time Hall-of-Fame coach of the men’s basketball team (whose annual salary is $7.7 million without the additional money from Adidas). The contract pays the university for requiring the sports teams, presumably all of them, to wear uniforms and equipment, provided by Adidas, with the Adidas logo prominently on display. This is not unusual and has been going on for years, not only with Adidas but also with Nike and with Under Armour as well. The rationale for taking money from these corporations as put forth by people like Bobby Bowden, former head coach of the Florida State football team, is that “somehow we have to pay the bills.” Indeed. In any event, the liaison person between Adidas and the University of Louisville agreed to pay the family of a high-school basketball player $100,000 to make sure their son would play for Louisville. Apparently there is another high school player involved as well. This is the “pay-for-play” element and, of course, it also could be regarded as bribery. In any event, the FBI are now involved and they apparently don’t like what they see. Louisville is in the process of firing Pitino and the Athletics Director as well in order to cover their butts — though it’s a bit late for that. And Adidas will fire the head of global sports marketing who made the arrangements with the university to pay for the high school basketball player’s favors. But, more to the point, the university will attempt to keep the $160 million that Adidas has agreed to pay them for the privilege of supplying free athletics equipment. And this raises an interesting moral question: is it not the case that this sort of hypocrisy on the part of the university is precisely at the core of what is wrong with collegiate sports at the highest levels?? The Louisville administration knows their relationship with this corporation has soiled the university’s reputation but they will continue to enjoy the bribe (let’s call a spade a spade) because it’s a lot of money and they want to keep it. Presumably. The university ought to be setting an example for its students and putting things right with the academic and athletics sides of things. But they are simply going through the motions by firing Patino and the athletics director and hope the financial arrangements with a corporation that makes and sells athletics equipment will continue as though nothing has occurred. The stink from the major colleges is rank and it just seems to get worse. One would like to think that with the FBI turning over rocks the stink will get so bad that steps will finally be taken to cure the problem. The universities are about education and sports has its place, but as it is now it is the tail that wags the dog and that is not the way it should be. Not at all. This been a very, very bad year for Congresswoman Michelle Bachmann (R-Minn.). Her 2012 presidential ambitions ran into the squall of a sixth place finish in the Iowa caucuses, a large drop from a height peaking at her campaign winning the influential Ames Straw Poll. And now she finds herself mired in an ethics investigation, with her former chief of staff expected to tell an ethics panel that she made illegal payments during her 2012 presidential campaign. 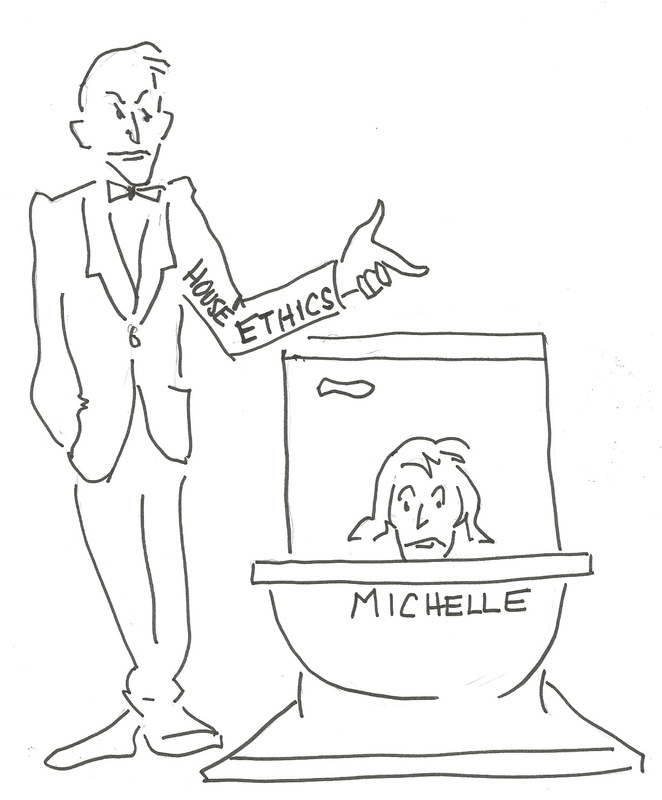 Michelle’s fall from great heights began during the last presidential campaign when she finished sixth in Iowa and allegations about campaign finance violations started to surface. Soon her staff was deserting her and she withdrew from the race; last Fall she barely won re-election to the House of Representatives, narrowly squeaking out a victory in a heavily Republican district against an unknown Democrat who hardly made an effort against her. The handwriting is on the wall, though politicians seem to have a problem reading it when it is there: they suffer from myopia. As noted, the problem started during her run for the presidential nomination when Peter Waldron, her national field coordinator, filed a complaint of alleged campaign finance violations. He later resigned from her campaign, as did a number of other staffers. More recently is has been alleged that she was using campaign funds to pay members of her staff to help her promote and sell her autobiography, Core of Conviction, which has sold a total of 3,000 copies to date. (Not on the New York Times Best Seller list!) Now the House Ethics Committee is investigating her — though I admit this seems a bit like letting the fox guard the chicken house — and her political career seems to be in the toilet. What a shame! Congresswoman Bachmann has denied all of the allegations, claiming that they are politically motivated, despite nearly all of the allegations coming from both former staff members and fellow Republicans. As the investigation rolls forward this story can only get more convoluted as new details come to light. You’ve got to love it! She cries foul and claims that the plot against her is “politically motivated” in spite of the fact that it is her own people, including her former Chief of Staff, Andy Parrish, who are going to testify against her. But, come to think of it, that it IS political motivation: getting rid of at least one unqualified and incompetent Representative. Now, where is that broom that we are told we can use to sweep clean the houses of so many other corrupt politicians? I have been beating this poor horse until he is long dead. I speak, of course, about the corruption in collegiate athletics which I first started writing about twelve years ago. I dare say you have heard about the latest scandal at Auburn where athletes were paid to remain on the football team rather than turn pro and grades were altered to guarantee that certain players would be eligible to play in a bowl game. This comes on the heels of the scandal at Rutgers where a basketball coach was fired and his assistant resigned after films were aired on television showing both of those men hurling basketballs and homophobic epithets at their players, kicking at them, and generally making spectacles of themselves to the endless entertainment of the ESPN viewers. A handful of faculty at Rutgers (only a handful?) has written a letter demanding the resignation of the athletics director and the president of the university who both knew about the behavior of the coaches since last November and chose to treat it lightly it until it became public knowledge. There are several things about these incidents that concern me and move me to prod the poor horse once again. To begin with, why didn’t the president of Rutgers fire the coach immediately upon seeing the films that have recently become public knowledge rather than to merely fine him and require that he attend anger-management classes? Further, why didn’t he or his A.D. fire the assistant coach who simply was allowed to resign? And why was the head coach paid a $100,000 bonus “for completing the season” after he was fired? All of these questions are begging for answers, but are below the one that tops my list: why don’t the officials at these universities act prior to the release of information to the general public? As the talking heads on ESPN were quick to point out, everyone has known for six decades that things are rotten in the state of Division I athletics. What has been exposed at Rutgers and Auburn is almost certainly going on at other Division I schools, probably all of them. Why does it take public embarrassment to make the administrators at those institutions take action? If it’s not just plain stupidity, then I suppose it must be about money. There’s a tremendous amount of money involved in athletics at that level. The reason the athletics director at Rutgers has not as of this writing been fired, for example, is that (reportedly) he was instrumental in bringing Rutgers into the Big Ten — which will guarantee the school a minimum of $25 million a year as a member of that august athletic conference (which will soon consist of fourteen members: go figure). It really is all about money, isn’t it? Money is more important to these institutions of higher education than the students they are supposed to serve. You would think that at the very least they would want to avoid the public humiliation. Maybe it is stupidity. There are those who will defend this sort of corruption on the grounds that it merely reflects the culture at large. While I must agree that this is true in this case, I have never understood that defense. Doesn’t that condemn the culture at large rather than defending the institutions that have sold their souls for filthy lucre? As the dust begins to settle on the failed attempts by the Democrats to recall Scott Walker in Wisconsin, it behooves any blogger worth his salt to utter an opinion or two. So here goes. I was asked by a friend if I was surprised by Walker’s win and had to answer that I honestly was not. In many ways it was predictable. The Republicans are still crowing — if you’re quiet you can hear them. And the Democrats are acting a bit like a Christian Scientist with appendicitis [thank you, Tom Lehrer]. But the fact remains that the Republicans outspent the Democrats 8 to 1 with the Koch machine cranking out most of an estimated $45 million to keep Walker in office and send a message to the Democrats that America really does love its pocketbook above all else. The Hell with teachers and nurses! The Koch brothers are a big part of what is wrong with this country. Rumors have it that they plan to spend $400 million of their hard-earned money to get Obama out of the White House and keep control of the Congress. They might succeed, of course, because as we all know money talks and after the Citizens United decision the amount of money that will be spent on the upcoming elections could buy a small country — or a large one that’s deep in debt. After all, the family oil business the Koch brothers own rakes in an estimated $100 billion a year! The sky’s the limit! But note the irony in the fact that people like the Koch brothers will spend millions of dollars to buy politicians who will guarantee that they get to keep most if not all of their wealth in the future. I dare say they see it as an investment. Some of the wealthy 1%, I understand, even buy politicians on both sides of the political aisle. That way they can’t lose. The interesting question is what on earth the founders would say about the turn of events. So let’s speculate. There are a number of myths rising from the “spiritually certain” about the religious preferences of the founders, insisting that they were all devout Christians. In fact there were some Christians within the group, but most were deists who didn’t attend church or believe in the efficacy of prayer. And they certainly did not want the church (any church) interfering in politics. They knew and hated England which had a state church and they saw the same sort of influence in France and Italy where the Catholic Church was all-powerful. They knew they didn’t want any of that. The recent tie-in between the political right-wing and the spiritually certain would have been bothersome to the founders. But they were also suspicious of capitalism in its raw forms. A number of the Colonies had restrictions on the unfettered growth of capitalism, such as laws against primogeniture, the passing on of wealth to the first-born son. They saw that as a sure way to aristocracy which they distrusted almost as much as they did the King. Many were still wedded to the comfortable notion of mercantilism, which favored the involvement of the government in the financial affairs of its citizens. These were wise men who, for the most part, knew that humans left to their own wiles would get into a dog-eat-dog fight over wealth and they didn’t want to see that either. People like Jefferson saw the future of this country in terms of an agrarian ideal in which people would remain close to the earth and earn enough money to be content and have whatever they required to live a good life, but no more. “More” was not necessary and it could lead to moral blindness. Initially the founders, especially the Southerners, didn’t even want a Federal bank, though Alexander Hamilton finally persuaded them to go in that direction — as a matter of necessity. And many of the wealthy citizens helped support the young nation (and the revolution) with money out of their own pockets. The attitude toward money in this country in the eighteenth century was quite different from ours now. For the most part money was seen as a means to an end, simply. There were remnants of a deep-seated medieval distrust of money and what it did to people — ultimately stemming from Christ’s admonitions in the New Testament. Just read Dante’s Inferno and try to figure out how many of those in Hell are there because of their relentless greed. That attitude took centuries to die out, but it is pretty much a thing of the past as, thanks to people like John Calvin, we now think that wealth is a sign of talent, ability and even, perhaps, God’s favor. You cannot have too much. If you do, you can always go out and buy yourself a country — like the Koch brothers. If the economy were booming this would be hard to fathom; in this economy it is positively obscene. It really doesn’t warrant further comment. But it is certainly worth pondering. And speaking of obscenities, the same issue contains an editorial that suggests a plan to put some of the huge amounts of money generated by college football to good use. It stops short of the notion that the athletes who generate the money should themselves be paid (as I have proposed elsewhere), but suggests instead that the money be taken away from the “coaches, athletic directors, conference commissioners, and bowl officials” and doled out to the “destitute communities from which so many of their leading performers come.” It mentions, almost in passing, that the average football coach at a BCS school today makes $2.1 million. Not a bad day’s pay! It’s an intriguing notion and helps to draw attention the the rotting state the colleges and universities are in that take in huge amounts of money from athletes who now complain they can hardly get by on the amount given them in the form of athletic “scholarships.” In the face of the fact that the NCAA recently met and simply sidestepped the athletes’ request for some sort of assistance, one must suppose that Smart’s suggestion will fall by the wayside. In addition to tithing, the editorial also endorses a plan to have top-tier NCAA schools reduce the number of football “scholarships,” cut spending on non-revenue sports, and institute a NCAA football playoff — an idea that’s been “out there” for years and is discussed and dismissed summarily by the football conferences who see it as a reduction in their profits. And there’s the rub: any plan, no matter how sensible, will not fly because it will take money away from those making huge profits from college football and basketball. As I say, it’s obscene, especially since these are supposed to be educational institutions. For some time now I have bemoaned the incursion of big money into sports in a world that is supposed to be focused on the life of the mind. I don’t advocate ridding our colleges and universities of sports altogether. Heaven forbid! But I have often said, in print, that it should be in its proper place. Lately others have begun to complain about the immense role organized sports play in the lives of college students — especially at the Division I level — and the role big money plays in those sports. Most recently, “Sports Illustrated” has published a lengthy article recommending steps they think will help to remedy the situation. This seems to be a response to a large number of student-athletes in Division I schools that have petitioned NCAA for a lion’s share of the huge amounts of money that comes to their respective campuses from TV, especially. Those students have even suggested forming a union! My recommendation, in an article published in “Montana Professor” in 2001 is to stop the pretense altogether and pay the athletes in the major revenue sports at the Division I level and let them use some of the money to pay their own tuition if they really want an education. There would then be a second division in athletics similar to the current Division III where students would participate in sports for the love of it. There are clearly benefits from sports and a case can be made that those benefits complement the benefits from education itself — which is to put young men and women in possession of their own minds. But it is quite possible (and even likely) that sports at the “highest” levels in our colleges and universities actually interfere with the goals of education.The recommendations in “Sports Illustrated” are interesting and they would save the universities millions of dollars, but they don’t go far enough. If you want to know more about my outrageous suggestions, read the article Dana Yost wrote on my Web Page, or the article I wrote which is also somewhere on these pages.